Place potatoes in 4-quart saucepan or Dutch oven. Add enough cold water to cover 1 inch over potatoes. Heat to boiling. Reduce heat to medium; simmer uncovered 15 to 20 minutes or until potatoes are fork-tender. Drain potatoes; rinse with cold water. Place in single layer in 15x10x1-inch pan; refrigerate until cooled, about 30 minutes. Cut cooled potatoes into eighths (bite-size wedges). In large serving bowl, mix remaining ingredients. Gently fold in potatoes. 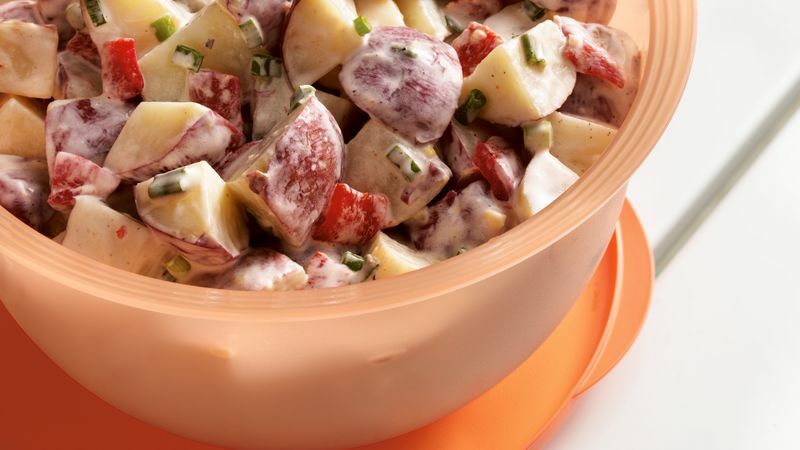 Serve immediately, or cover and refrigerate until serving time. Sizes of jars of roasted red bell peppers vary. Use about 1 cup chopped peppers for this recipe. This recipe was tested with real mayonnaise, however reduced-fat mayonnaise can be used.